Just as the spring breathes new life into the world following winter, artist Tim Yanke revives the spirit of the Southwest through his depiction of the iconic Kokopelli. 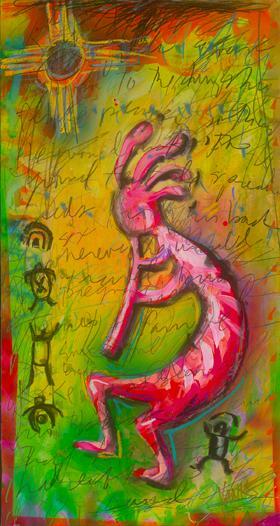 Kokopelli (pronounced “Cocoa-pell-e”) is a fertility god of some Native American cultures. The deity is also considered a prankster, healer, and storyteller. Kokopelli’s association with fertility includes both childbirth and agriculture. Certain tribes, such as the Zuni, believe that Kokopelli’s music chases away the winter and ushers in spring. The deity is often portrayed as a hunchbacked flute player with a decorative crest on his head. The first known images of Kokopelli appeared on Hogokam pottery around 750 to 850 C.E., while pictographs and petroglyphs in the Southwest depict the deity starting in 1000 C.E. Yanke draws inspiration from the culture, colors, and traditions of Southwest America to create his signature Neo-West style. Among Yanke’s imagery of buffalos and headdresses is Kokopelli. 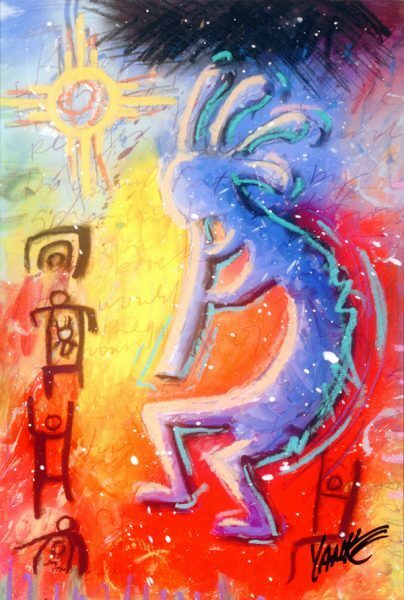 Unlike these ancient depictions, however, Yanke uses bold, bright colors in his Kokopelli series. The artist says these colors give Kokopelli a 21st-century feel instead of the traditional sepia and terra cotta tones associated with the West. Along with fertility, Kokopelli represents the spirit of music, which is fitting for an artist who claims two of his most important tools in the studio are his satellite radio and iPod. As a music lover, Yanke says influences such as the Grateful Dead play a role in coloring Kokopelli. 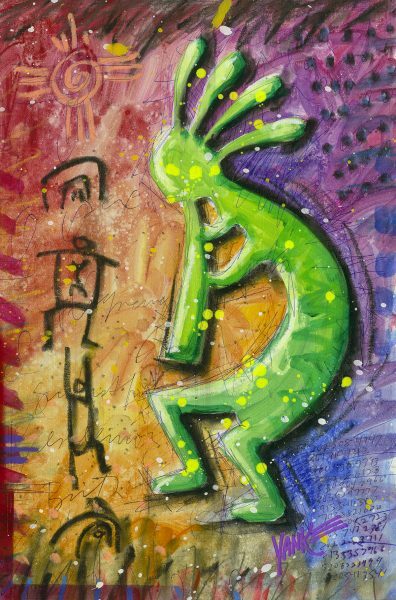 In the Kokopelli series, Yanke includes glyphs used by Native American tribes to emphasize the god’s roles. When read together, the symbols represent bringing a new life into the world. 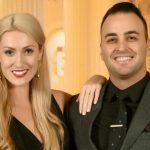 Fans of “The Bachelor” may have noticed Yanke’s Kokopelli during the 20th season of the show. The bachelor’s fiancée, Whitney Bischoff, is a nurse working at a fertility lab in Chicago. 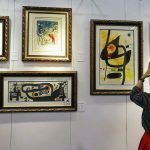 If one watches carefully, one of Yanke’s Kokopelli works is seen hanging on the wall of the lab in this video by Good Morning America. Yanke’s love of the Southwest began when his family visited his brother and sister while they attended college in Arizona. Yanke was 12 years old at the time, and fell in love with the beautiful landscapes. In 1976, when his sister was returning to Michigan to visit, she died in an auto accident. Since then, the Southwest became synonymous with remembering his sister. For more information on how to collect Tim Yanke artwork, contact our gallery consultants at (800) 521-9654 ext. 4 during business hours or sales@parkwestgallery.com after hours.